With its high-sounding title – taken straight from the realms of philosophy – Homunculus Res’ debut might initially give the impression of yet another stereotypically pretentious “conventional” prog opus. However, a closer look at the distinctive cover artwork depicting a mushroom-sprouting human head next to a tiny gnome in a pointed red hat should readily clue the listener in on the album’s true nature. Hailing from the Palermo, Sicily, the band – one of the newest recruits of the thriving AltrOck Productions stable – is a loose configuration of musicians revolving around multi-instrumentalist and main songwriter Dario D’Alessandro. If the triangular island in the southern Mediterranean sounds like an unlikely birthplace for a progressive rock band – especially if compared with hubs such as Genoa or Milan – it should be pointed out that Franco Battiato, one of the most iconic figures of the early Italian prog scene, also hails from Sicily. Like Battiato, Homunculus Res blend high and popular culture in their lyrics, and also enjoy citations from other musical sources, even though their sound is firmly rooted in the Canterbury tradition. The breezy, often infectious quality of the music – interspersed with more sedate, almost introspective moments and some seriously intricate instrumental flights – recalls early Soft Machine and Caravan, as well as fellow Italians Picchio Dal Pozzo (whose legitimate heirs Homunculus Res are poised to become) and Stormy Six, or even a more obscure Canterbury-inspired gem, Cocktail by Patrick Forgas (who later went on to form the outstanding jazz-rock combo Forgas Band Phenomena). Most of the album’s 18 short tracks (whose titles will reveal an intriguing mix of highbrow, whimsical and more down-to-earth elements) are so closely linked together musically that they almost flow into each other – especially the instrumental numbers, mostly concentrated in the second half. In spite of the album’s overall light-hearted attitude and apparent focus on shorter compositions, the music is richly textured, thanks to the band’s impressively varied instrumentation. While keyboards (supplied by D’Alessandro, Davide Di Giovanni and Federico Cardaci, as well as special guest Paolo Ske Botta) are clearly the stars of the show – aided and abetted by Daniele Di Giovanni’s ebullient, acrobatic drumming – the guitar plays a discreet but invaluable supporting role, only rarely stepping into the limelight. The album opens with a song that will stick in your head for a long time – the mostly instrumental “Culturismo Ballo Organizzare”, whose almost 6 minutes are packed with exhilarating stops and starts, while vocals are used as an irresistibly quirky enhancement of the musical line rather than the “main event”. The following “ΔU” starts in a deceptively low-key, almost wistful manner reminiscent of Hatfield and the North, then turns frantic and chaotic, with strident synth dominating the tune. “DJ Psicosi” returns to the upbeat form of the opener, its title repeated in almost hypnotic fashion, while a weirdly echoing trumpet adds a nostalgic note. The Canterbury vibe takes over in “Preparazione Bomba H”, as well as in the majority of the instrumental pieces comprising the second half of the album (which also occasionally hint at Latin and Brazilian rhythms). Occasional references to other artists crop up throughout the album, as in the nod to Michael Jackson’s “Billy Jean” in the above-mentioned “Dj Psicosi”, and the lullaby-like homage to Fabrizio De André’ “La Guerra di Piero” at the beginning and at the end of the flute-laced “(che ne sai tu di un) Cerchio nel Grano” (whose very title hints at Lucio Battisti’s “Pensieri e parole”). On the album there is also room for a couple of ballads, whose apparently romantic tone is belied by the subtle irony of the lyrics – “Jessicalaura” and “La ballata dell’amore stocastico”, in which Dario D’Alessandro channels his inner Richard Sinclair, accompanied by elegant piano. The energetic “Rifondazione Unghie”, on the other hand, features dynamic flute and guitar interplay in pure Jethro Tull style; while the subdued mood of album closer “Il Contrario di Tutto” emphasizes the lyrical musings on the plight of a disillusioned young man longing for an escape from day-to-day routine. Loaded with humour and the obvious pleasure of the craft of music-making, Limiti all’eguaglianza della Parte con il Tutto is the perfect antidote to too much overwrought, self-important prog. Though the lyrics and their cultural references might be lost on non-speakers of Italian, an understanding of the words is not necessary to enjoy the album and its sophisticated yet accessible brand of “Canterbury Samba Progressive”. 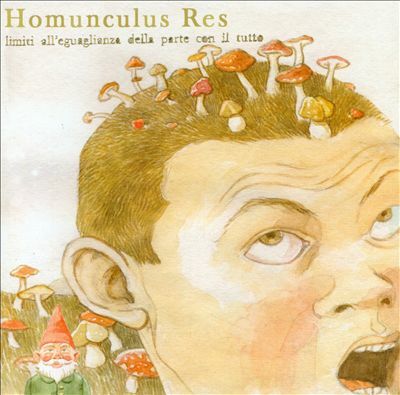 Highly recommended to everyone but those who believe that progressive rock and humour should not mix, or else object to non-English lyrics, Homunculus Res’ debut is a delightful, intelligent album that effortlessly blends retro and modern attitudes, with the added interest value of Dario D’Alessandro’s outstanding artwork. Spot on, Raff!! I love this record! It is indeed infectious. Thank you, Dan! A lovely album indeed. It would be wonderful to see them at ProgDay next year! Yet another outstanding review, Raffaella! I have yet to purchase this album but will do so, soonest. Many thanks!